The Virtual Observatory (VO) is a virtual astronomy facility that aims to create large-scale integration of astronomy and astroparticle physics data, tools and services in a global, distributed and interoperable data infrastructure. The VO allows researchers to easily discover, access and use astronomical data from instruments around the world, and to use the VO-enabled tools on this data. 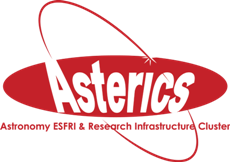 ASTERICS works on preparing ESFRI facilities’ data for the VO and on training scientists to learn to work with the VO. ASTERICS aims at supporting the ESFRIs to become both consumers and actors of the VO. The facilities are providing input and feedback and participating in VO trainings and schools. They implement relevant VO building blocks in their data management and data sharing systems, use VO tools, and participate in the development of the VO standards and tools. Development and completion of International Virtual Observatory Alliance (IVOA) standards to fit the ESFRI requirements is another important aspect of the VO part of the ASTERICS project. Within the framework of ASTERICS, the IVOA multi-dimensional standards were completed, the provenance data model is submitted to become an IVOA standard, and the activity on Time Domain took a new start. A recent example of how the VO is used in the astronomical and astroparticle physics community is gravitational wave follow-up. VO tools were used to display results and gather follow-up information (Figure). GWSky is a script for Aladin that was developed in the context of ASTERICS. Finally, dissemination of VO results and tools is also an important part of the ASTERICS project, and happens both at the national level (also beyond partner countries) and at the European level through schools, meetings and tutorial development. Gravitational Wave researchers use VO tools to display results and to gather follow-up information. Image credit: LIGO-VIRGO collaboration, Aladin Sky Atlas - Mellinger background survey.